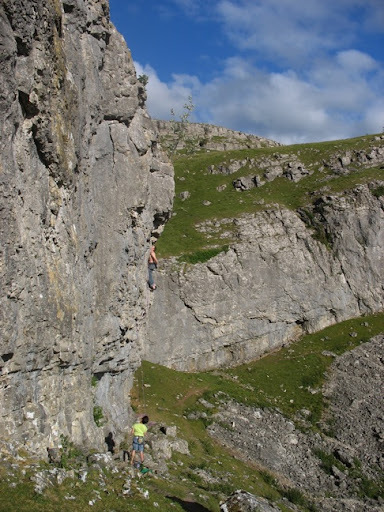 Local climber, Mark on one of the classic 7c’s of Dinbren. Sean Marnane belaying. At Dinbren, been trying some of the classic lines. So far, no go on any of the harder routes. Elite Syncopations, one of the 8a’s is killing me on the first crux - I can walk the rest. I just don’t have the power for the first undercut move. But progress was being made before I continued to try others. The 8a that Dave did a few weeks ago, I had it dialled until one of the first holds fell off. Again, haven’t been on it since. Another route, Highway (7c+ - 8a, depending on your route), was a close call last weekend - I worked it once, took a rest for an hour and then fell off on the final moves due to a footwork mistake. Bit frustrating but as always there’s positives to be taken from it. I clip from a single-pad mono, and do the next move off my ring-finger mono so strength of fingers is back and firing on all cylinders. And considering I’d only worked the route once, it was a great first effort. I was taking the 7c+ version (if there’s holds there, I’ll use them and not just stick strictly to the bolt line - seems stupid not to. I’m climbing the routes for the fun movement, not to say I ticked individual grades!). In between all that, there was an epic going-away bash in Llangollen for Dave&Caroline - lots of fun, and again great to see how well everyone is climbing. I’d better get the finger out so I can keep up!